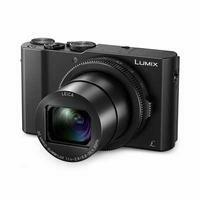 Designed for creative photographers, the Panasonic Lumix DMC-LX15 Digital Camera is a premium compact camera that features 4K video recording capability. With an aperture of f1.4-2.8, this powerful camera gives beautiful bokeh effects, and produces brilliant images no matter the lighting or shooting environment. Macro photography is also possible with its minimum focus distance of 3cm. Battery (DMW-BLH7E), AC Adapter, Hand strap and USB Cable.